In a case that could test the issue of authors' rights in the comic book industry, the creator of Blade--the character featured in the $45-million New Line Cinema movie of the same name--has sued the studio, parent Time Warner and comic book publisher Marvel Entertainment Group for at least $35 million. "Blade" was created by comic industry veteran Marv Wolfman, who also seeks to establish his ownership of the copyright and trademark of the 26-year-old character. The film, which opens today, stars Wesley Snipes in the title role. It has been common practice for comic book publishers to claim all rights to characters created in the 1970s and before; publishers have argued that such work is "work for hire" on the part of creators, making it part of a "contribution to a collective work" owned by the publisher. Although sales of comic books themselves have been in a serious slump for several years, the explosion of merchandising and the success of such comic book-based feature films as the "Superman" and "Batman" series has made character ownership potentially lucrative. Many creators have felt wronged by being excluded from the profits of their creations over the years, but only a handful of suits have been filed. A lack of sophistication and money on the part of the creators--combined with powerful publishers wielding a favorable interpretation of copyright law--have kept many from suing. "A lot of the creators over the years have been 19-year-old kids, who trusted the publishers or were just naive," said Christine Valada, a Los Angeles attorney representing writers and artists. 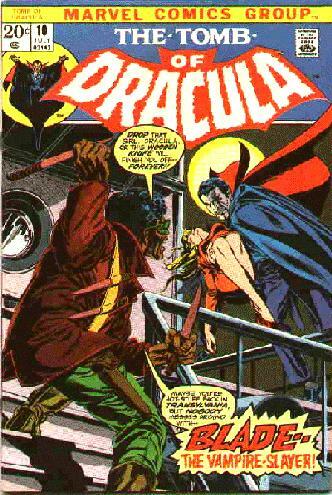 Wolfman's case hinges on the claim that he was an an independent contractor for--rather than an employee of--Marvel at the time he created Blade and nemesis Deacon Frost (played in the film by Steven Dorff) for an issue of "Tomb of Dracula" in 1972. Wolfman, who went on to become a top editor at both Marvel and D.C. Comics, was employed at the time by Warren Publications. He maintains that there was no written or oral agreement at the time he created Blade that gave ownership to Marvel. Over the years, Wolfman has complained several times to Marvel about its use of Blade in other media without giving him compensation. Months of letters and phone calls resulted in Wolfman receiving a credit on the film, but no money. "I didn't want this to get to a lawsuit," said Wolfman. Marvel is not immediately being served in the case, since the company is in Chapter 11 bankruptcy reorganization (it is expected to emerge this fall). David De Lorenzi, attorney for Marvel's bankruptcy trustee, John J. Gibbons, said Marvel claims ownership under the argument that Wolfman's creation was work for hire. "[Wolfman] knows that. He doesn't have any ownership rights," De Lorenzi said. The few previous suits of this type--such as one filed in the 1980s by Howard the Duck creator Steve Gerber over the use of his character in the movie of the same name--have generally ended up being settled. Wolfman's suit, filed in Los Angeles Superior Court, comes at a critical time for Marvel, as it prepares to emerge from bankruptcy and produce future films. Marvel's "X-Men," which may go into production late this year, features several characters whose ownership could be similarly contested. "This case goes beyond money and credit," said Adrian Askarieh, an attorney for Wolfman. "[Wolfman] is not being allowed to benefit from his hard work and creations. He's excluded from the celebration going on around these characters."